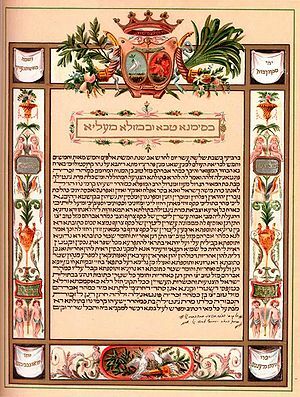 a marriage contract outlining each partner’s duties. than in a roomy house with a quarrelsome woman. Quarrelsome wives appear frequently in Proverbs. While there are also prudent, diligent women, it certainly seems sexist – until one remembers that the many people referred to as wicked fools who stray from the way of the just were all men. Still: what is the point of harping on these quarrelsome women? Well, the Proverbs are addressed to a son – so the advice about men focuses on those who are foolish, rash, or lead one astray. But what is one supposed to do with this advice about the quarrelsome wife? What about those who are already married? We tend to read this proverb through the eyes of divorce – better to go somewhere else, to be rid of the quarrelsome wife. The Mosaic law seemingly made it easy to divorce a quarrelsome wife. (It’s not clear how frequently this was practiced: in a culture with strictly complementary roles, a man needed a wife to survive – and it would be harder to get a second one after lightly discarding the first.) Proverbs, however, rarely advises someone to turn back from a pledge; even here, it implies that one will stick by his wife. Perhaps the advice is aimed at mediating the relationship, changing the young man’s behavior so the wife is less quarrelsome. Rather than wanting things his own way, it would be better to have just “a corner of the housetop” in order to have peace with his wife. Elsewhere, the proverbs have urged that he guard his words and shun strife – “every fool starts a quarrel.” As in his actions in the marketplace, so in his home: better to make peace with humility than to get one’s way – and a quarrelsome wife. than with a quarrelsome and vexatious wife.